Etisalat, which operates in India in collaboration with the DB Group, would prefer to merge operations with a suitable entity and is ready to surrender the licences it has in 15 of the 22 pan-India circles to the government once it identifies a partner, a senior official from the company, who did not wish to be identified, said. Etisalat has already invested $900 million to acquire 45% of Etisalat DB Telecom, a venture with Indias DB Group. Etisalats CEO, international investments, Jamal Al Jarwan, was quoted two days earlier stating that the firm was exploring options in India and was interested in acquiring a stake in Idea Cellular. 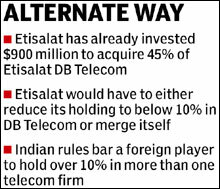 However, Etisalat would have to either reduce its holding to below 10% in Etisalat DB Telecom or merge itself with an Indian telecom firm as Indian investment rules bar a foreign player to hold over 10% in more than one telecom firm. "Etisalat wouldnt reduce the stake (in Etisalat DB Telecom), instead merge operations with the new entity, if they get a deal at an attractive price. The firm is also expected to launch commercial services soon," an executive said. In that case, Etisalat would also have to surrender additional spectrum post the merger. The Telecom Regulatory Authority of India (Trai) recommendation on spectrum management and licensing framework issued on May 11, 2010, recommends that consequent upon the merger in the licences in a service area, the total spectrum held by the resultant entity shall not exceed 14.4 MHz for GSM and 10 Mhz for CDMA. Etisalat DB owns 4.4 Mhz of spectrum across all 15 circles. In addition, Indian rules prevent companies from pursuing mergers for three years after they buy a licence. Etisalat DB got its phone licence in 2008. A lot of new players are ready to surrender the licences post merger. However, there is no clarity on regulation if they would receive the licence fee back, an analyst from a broking firm said. Etisalat DBs India unit vice -chairman Shahid Balwa said the firm was not in talks with any of the Indian players at the moment. We are not talking to anyone in India at the moment, he said. According to Balwa, the firm has been misquoted because Idea Cellular is not for sale and we are not in talks with them.